Elizabeth Nurse is an accomplished and versatile violinist, experienced in leading chamber groups and orchestras as well as playing as a soloist. She studies with Paul Barritt. 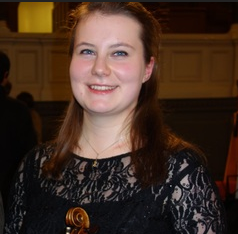 Elizabeth is the leader the Oxford University Orchestra and in November 2015 was awarded an Orchestral Apprenticeship with the professional Oxford Philharmonic Orchestra. In September 2016, she was appointed Konzertmeister for the critically acclaimed Szene12 production of ‘La Bohème’ in Dresden. Elizabeth is a second year Music undergraduate and Choral Scholar at The Queen’s College, Oxford.